“What is the best free video watermark maker to add watermark to video free online? I have a few videos and would like to add logo to these videos for free. Was told that online video watermark maker would be helpful. Therefore, what’s the best free video watermark software online? Or is there any alternative solutions to help me add watermark to video? Thanks.” asked by Ken on Quora. You may want to add text or image as watermark to your video online for free, but have no idea which video watermark tool to make use of. 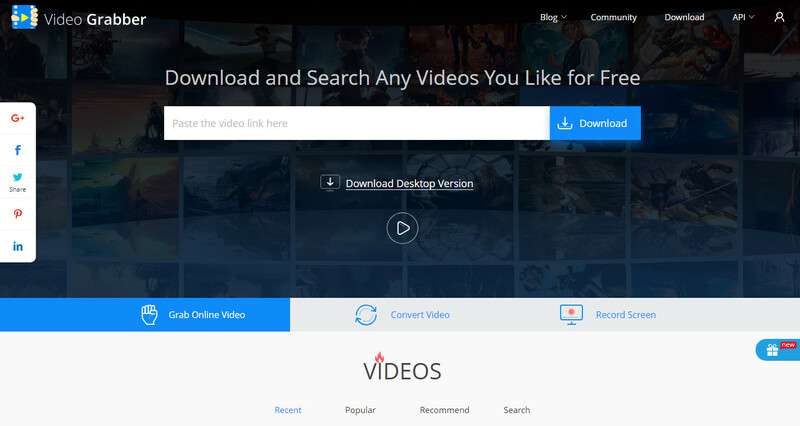 Well, in this guide, we would like to share 5 best free video watermark software tools to help you add logo to video free online. The below lists 5 free video watermark maker tools to help you add logo to video free online. All these video watermark software could help you add either text or image as watermark to your videos for free. You could freely choose any of them. 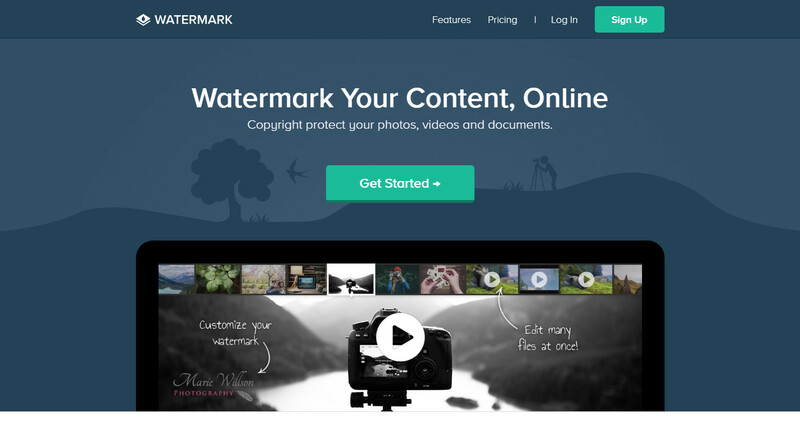 Watermark.ws is a practical and free video watermark maker software tool that enables you to add watermark to video and edit video online. It enables you to add text watermark, adjust text watermark position, change text font, etc. 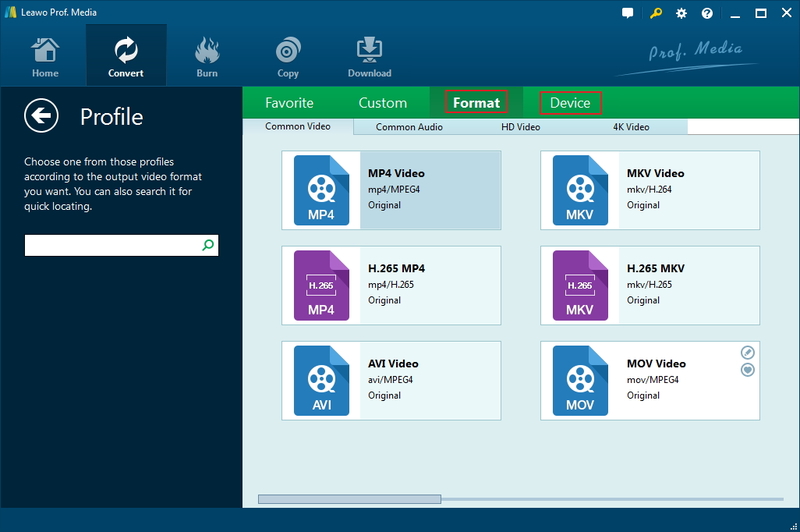 It’s also a video editor that enables you to crop, trim, resize your video and photo, etc. 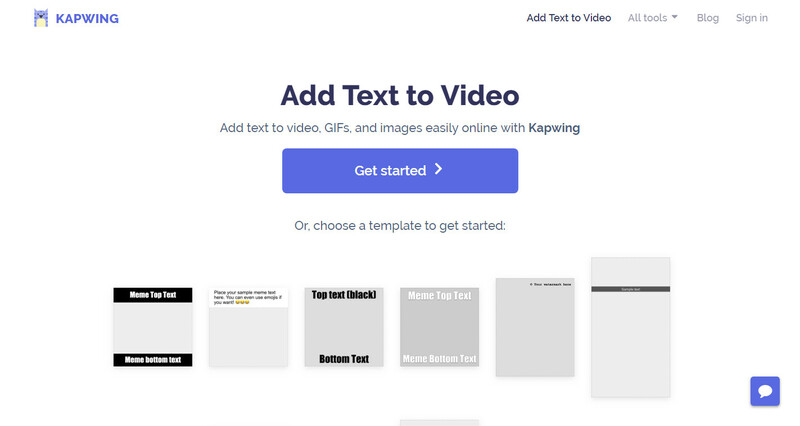 Kapwing.com is an online video editor that enables you to upload your video, GIF, or image files to add text as watermark and then share the watermarked video or photos onto Facebook, YouTube for sharing or save to your own computer. Kapwing is completely free to use and requires no downloads. 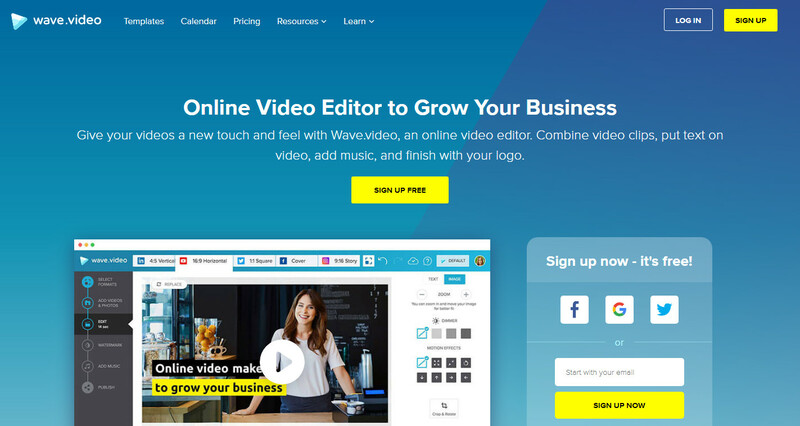 Wave.Video is an online free video editor that could enable you to combine video clips, put text on video, add music, and finish with your logo. It enables you to not only add text as watermark to video online for free, but also trim video length, dim video effect, combine several video clips into one, resize video, etc. Video Grabber is not only an online video downloader, but also comes with a practical video editor. With the online video editor, you can trim, crop video clips, add watermark, effect and even adjust playback speed and volume. It enables you to add image as watermark you’re your local drive to your video online free. 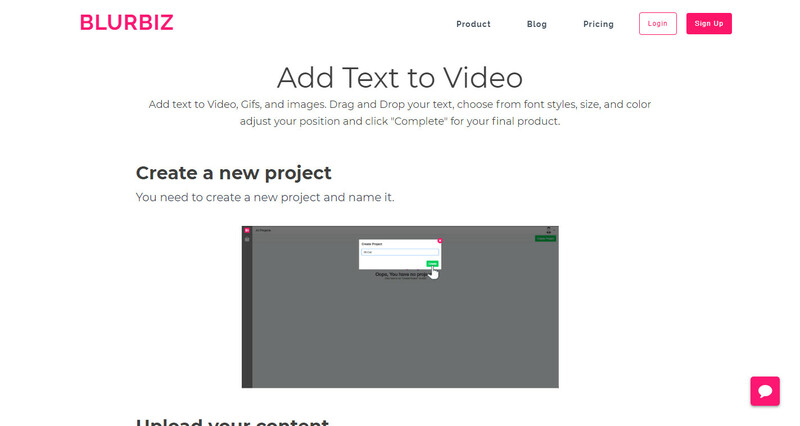 BLURZIZ helps you add text to video, Gifs, and images. You only need to upload your video from local drive, drag and drop your text, set the font styles, size, and color, adjust text position and click “Complete” for your final product. It’s quite easy to use for you to add watermark online free with this free online watermark maker software. We would like to recommend you the best watermark adder software to help you add logo to your video on your computer, even you haven’t connected your computer to the Internet. 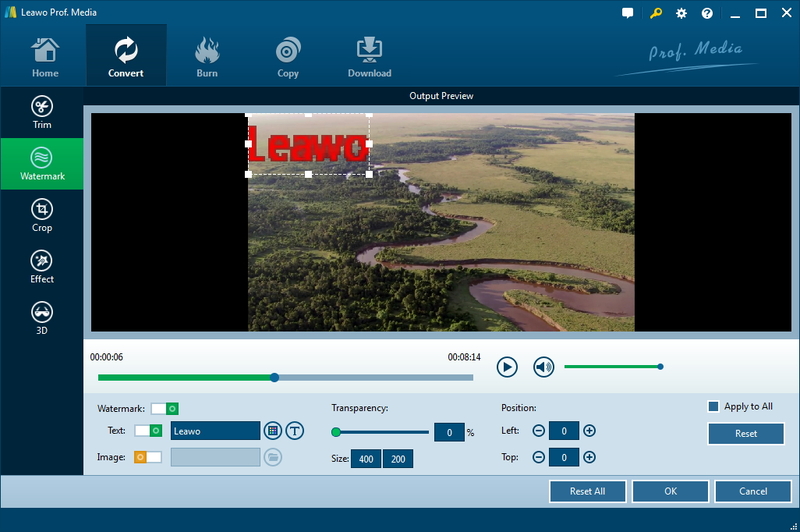 That’s to make use of Leawo Video Converter, a professional video converter that comes with a practical video editor to let you add either image or text watermark to a video on computer, be it Windows or Mac. What’s more, it helps you convert video to 180+ formats so that you could share your videos on any device or play on any player. Download and install Leawo Video Converter on your computer. Then, follow the below steps to learn how to add watermark to video with this video editor. Open the “Convert” module after launching Leawo Video Converter. Then, click “Add Video” button to browse and add video files from your local drive. After loading source video file(s), click the edit button in each loaded video title to enter the editing panel. On the editing panel, open the “Watermark” tab and then switch the “Watermark” option to green. Switch either image or text option to green to add desired watermark type to video. You can adjust watermark position, transparency, text font, text color, etc. Besides adding watermark, this video editor also allows you to do other editing work, including: trim video length, crop video size, adjust video effect, apply 3D effect, etc. You could do them one by one. Click “OK” button to save editing and return to the main interface. Now, click the drop-down box before the big green “Convert” button and then choose “Change” option. On the popup Profile panel, choose output format from either “Format” or “Device” group. To meet your requirements, you could adjust the parameters of selected profile, including video codec, bit rate, aspect ratio, frame rate, audio codec, channel, sample rate, etc. To change these, click the “Edit” option on the drop-down panel after setting output format. After setting output format, click the big green “Convert” button. Then, set output directory in the “Save to” box on the popup sidebar. Finally, click the bottom “Convert”. Leawo Video Converter would start to convert the videos you’ve added watermark to immediately. The converting would take a few minutes, depending on the file size and your computer performance. After converting, you could then freely use the final videos in any way you like.